Here is my Critter of the Month for November 2013. He is a Horse Head brooch and the picture shows him with the page in my Technical notebook where I colour tested suitable enamels. He is sgraffitto enamel on hand pierced copper with soldered handmade findings on the reverse. 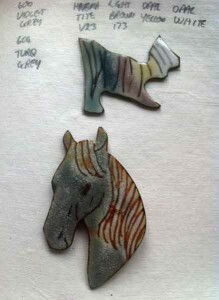 Unlike other sgraffitto brooches I have made, this one doesn’t include any lustre as I have made him more naturalistic. As a child I adored horses and spent hours drawing them, so it was a real pleasure to get some of my old books out to develop this design. I hope you like him.